Team Virtual Flow Metering: Nils Barlaug, Trygve Karper, Stian Laagstad, Erlend Vollset (all from Cognite) and Emil Hansen (AkerBP). Tech: Cognite Data Platform, scikit-learn. GitHub repo. Project: An engineer from AkerBP brought a problem: testing the rate from a well reduces the pressure and therefore reduces the production rate for a short time, costing about $10k per day. His team investigated whether they could instead predict the rate from other known variables, thereby reducing the number of expensive tests. This project won the Most Commercial Potential award. The predicted flow rate (blue) compared to the true flow rate (orange). The team used various models, from multilinear regression to boosted trees. Team Gully Attack: Steve Purves, Eirik Larsen, JB Bonas (all Earth Analytics), Aina Bugge (Kalkulo), Thormod Myrvang (NTNU), Peder Aursand (AkerBP). Project: Deep reinforcement learning has proven adept at learning, and winning, games, and at other tasks including image segmentation. The team tried training an agent to pick these channels in the Parihaka 3D, as well as some other automatic interpretation approaches. The agent learned something, but in the end it did not prevail. The team learned lots, and did prevail! This project won the Most Creative Idea award. Early in training, the learning agent wanders around the image (top left). After an hour of training, the agent tends to stick to the gullies (right). A new kind of AVO crossplot? Team ASAP: Per Avseth (Dig), Lucy MacGregor (Rock Solid Images), Lukas Mosser (Imperial), Sandeep Shelke (Emerson), Anders Draege (Equinor), Jostein Heredsvela (DEA), Alessandro Amato del Monte (ENI). Tech: t-SNE, UMAP, VAE. GitHub repo. Project: If you were trying to come up with a new approach to AVO analysis, these are the scientists you’d look for. The idea was to reduce the dimensionality of the input traces — using first t-SNE and UMAP then a VAE. This resulted in a new 2-space in which interesting clusters could be probed, chiefly by processing synthetics with known variations (e.g. in thickness or porosity). This project won the Best In Show award. Look out for the developments that come from this work! Top: Illustration of the variational autoencoder, which reduces the input data (top left) into some abstract representation — a crossplot, essentially (top middle) — and can also reconstruct the data, but without the features that did not discriminate between the datasets, effectively reducing noise (top right). The lower image shows the interpreted crossplot (left) and the implied distribution of rock properties (right). Team: Jesper Dramsch (Technical University of Denmark), Thilo Wrona (University of Bergen), Victor Aare (Schlumberger), Arno Lettman (DEA), Alf Veland (NPD). 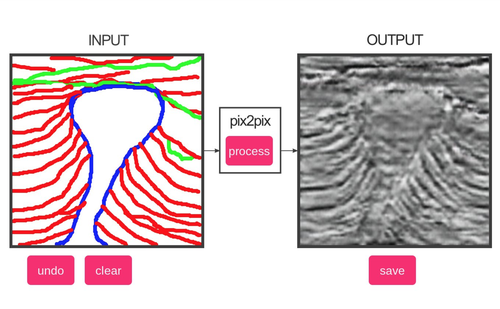 Tech: pix2pix GAN (TensorFlow). GitHub repo. Project: Not everything tht looks like a toy is a toy. 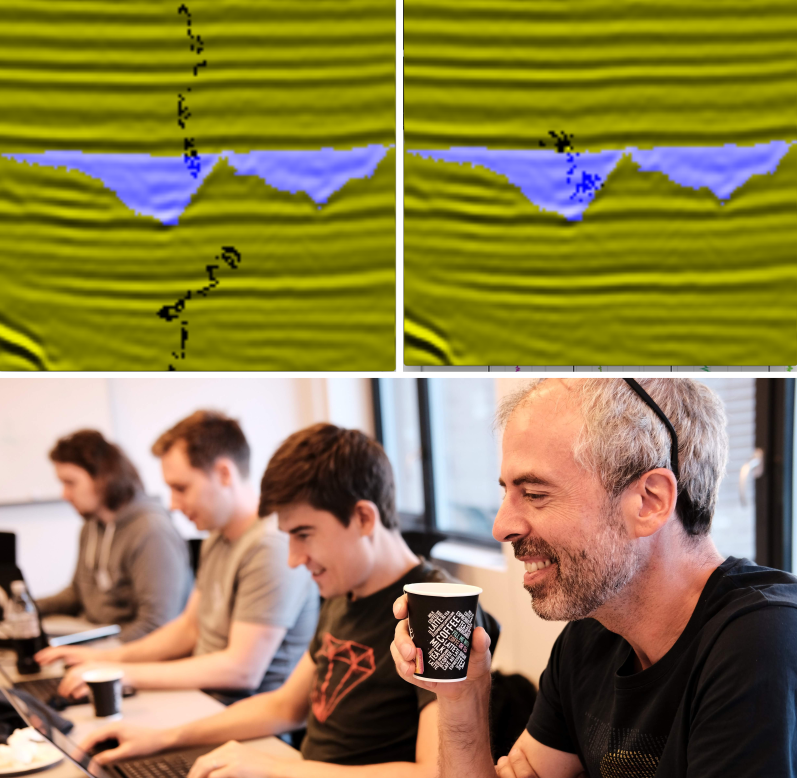 The team spent a few hours drawing cartoons of small seismic sections, then re-trained the pix2pix GAN on them. The result — an app (try it!) that turns sketches into seismic! This project won the People’s Choice award. A sketch of a salt diapir penetrating geological layers (left) and the inferred seismic expression, generated by the neural network. In principal, the model could also be trained to work in the other direction. Team: Florian Basier (Emerson), Jesse Lord (Kadme), Chris Olsen (ConocoPhillips), Anne Estoppey (student), Kaouther Hadji (Accenture). Project: A couple of decades ago, the last great digital revolution gave us PDFs. Lots of PDFs. But these pseudodigital documents still need to be wrangled into Proper Data. This team took on that project, trying in particular to extract both the depth of a show, and the confidence in its identification, from well reports. This project won the Best Presentation award. Kaouther Hadji (left), Florian Basier, Jesse Lord, and Anne Estoppey (right). Team: Eirik Time, Xiaopeng Liao, Fahad Dilib (all Equinor), Nathan Jones (California Resource Corp), Steve Braun (ExxonMobil), Silje Moeller (Cegal). Tech: sklearn, skimage, fast.ai. GitHub repo. Project: One of the many teams composed of professionals from all over the industry — it’s amazing to see this kind of collaboration. The team did a great job of breaking the problem down, going after what they could and getting some decent results. An epic task, but so many interesting avenues — we need more teams on these problems! The pipeline was as ambitious as it looks. But this is a hard problem that will take some time to get good at. Kudos to this team for starting to dig into it and for making amazing progress in just 2 days. Team: David Wade (Equinor), Per Olav Svendsen (Equinor), Bjoern Harald Fotland (Schlumberger), Tore Aadland (University of Bergen), Christopher Rege (Cegal). Tech: scikit-learn (random forest). GitHub repo. Project: The team used DEX files from five wells from the recently released Volve dataset from Equinor. The goal was to learn to predict geological age from biostratigraphic species counts. They made substantial progress — and highlighted what a great resource Volve will be as the community explores it and publishes results like these. Team: Andres Hatloey, Doug Hakkarinen, Mike Brhlik (all ConocoPhillips), Espen Knudsen, Raul Kist, Robin Chalmers (all Cegal), Einar Kjos (AkerBP). Tech: scikit-learn (random forest regressor). GitHub repo. Project: Another cross-industry collaboration. In their own words, the team set out to “identify trends between 4D seismic and well measurements in order to calculate reservoir pressures and/or thickness between well control”. They were motivated by real data from Valhall, and did a great job making sense of a lot of real-world data. One nice innovation: using the seismic quality as a weighting factor to try to understand the role of uncertainty. See the team’s presentation. Team: Tetyana Kholodna, Simon Stavland, Nithya Mohan, Saktipada Maity, Jone Kristoffersen Bakkevig (all CapGemini), Reidar Devold Midtun (ConocoPhillips). Project: The team worked on real 4D data from an operating field. Reidar provided a lot of maps computed with multiple seismic attributes. Groups of maps represent different reservoir layers, and thirteen different time-lapse acquisitions. So… a lot of maps. The team attempted to correlate 4D effects across all of these dimensions — attributes, layers, and production time. Reidar, the only geoscientist on a team of data scientists, also provided one of the quotes of the hackathon: “I’m the geophysicist, and I represent the problem”. That’s it for the FORCE Hackathon for 2018. I daresay there may be more in the coming months and years. If they can build on what we started last week, I think more remarkable things are on the way! What are you waiting for? Get signed up and tell your friends! The latest Geophysical Tutorial came out this week in The Leading Edge. It's by my friend Gram Ganssle, and it's about neural networks. Although the example in the article is not, strictly speaking, a deep net (it only has one hidden layer), it concisely illustrates many of the features of deep learning. Whilst editing the article, it struck me that some of the features of deep learning are really features of life. Maybe humans can learn a few life lessons from neural networks! Activation functions are one of the most important ingredients in a neural network. They are the reason neural nets are able to learn complex, nonlinear relationships without a gigantic number of parameters. Life lesson: look for nonlinearities in your life. Go to an event aimed at another profession. Take a new route to work. Buy a random volume at your local bookshop. Pick that ice-cream flavour you've never dared try (durian, anyone?). Neural networks learn by repetition. They start with random guesses about what might work, then they process each data point a hundred, maybe 100,000 times, check the answer, adjust weights, and get a little better each time. Life lesson: practice makes perfect. You won't get anything right the first time (if you do, celebrate!). The important thing is that you pay attention, figure out what to change, and tweak it. Then try again. One of the things we know for sure about neural networks is that they work best when they train on a lot of data. They need to see as much of the problem domain as possible, including the edge cases and the worst cases. Life lesson: seek data. If you're a geologist, get out into the field and see more rocks. Geophysicists: look at more seismic. Whoever you are, read more. Afterwards, share what you find with others, and listen to what they have learned. Yes, well, I could probably go on. Convolutional networks teach us to create new things by mixing ideas from different parts of our experience. Long training times for neural nets teach us to be patient, and invest in GPUs. Hidden layers with many units teach us to... er, expect a lot of parameters in our lives...? Anyway, the point is that life is like a neural net. Or maybe, no less interestingly, neural nets are like life. My impression is that most of the innovations in deep learning have come from people looking at their own interpretive and discriminatory powers and asking, "What do I do here? How do I make these decisions?" — and then trying to approximate that heuristic or thought process in code. What's the lesson here? I have no idea. Enjoy your weekend! Thumbnail image by Flickr user latteda, licensed CC-BY. The Leading Edge cover is copyright of SEG, fair use terms.